Once the most populous bird on the planet, passenger pigeons numbered in the billions. They migrated in three-hundred mile long flocks that could eclipse the sun for days. The birds overwhelmed the forests of North America, much like the bison dominated the Great Plains, in what naturalist Aldo Leopold called a “biological storm.” An Infinite Number will capture this spectacle and dramatize the extinction of the species. 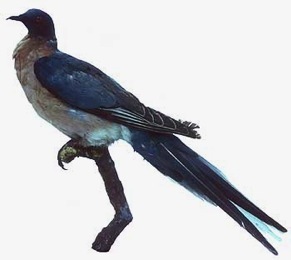 Native Americans and European settlers hunted the passenger pigeon for food, but with the coming of the telegraph and the railroad, the birds were hunted on an industrial scale and were doomed: the telegraph directed hunters to nesting sites and trains transported the meat to cities. 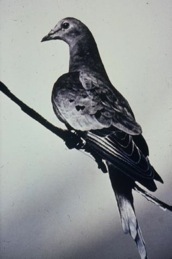 Unlike the bison, the passenger pigeon did not reproduce in captivity. An Infinite Number is based on descriptions found in newspapers, magazines, and diaries in the collection of the New York Public Library. Because the flocks vanished before the invention of the movie camera, no film footage exists. The story will be told with hand-drawn animation with the focus on the birds; humans appear only in silhouette and in profile. The running time of the film will be approximately thirteen minutes. An Infinite Number is a visual rendering of our role in effecting unimaginable ecological outcomes. 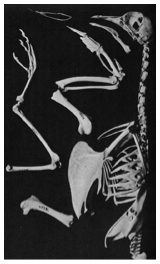 The film opens with the first sighting of the birds by European explores in 1534 and ends in the present, at a storage locker that contains the stuffed remains of the last bird. The story unfolds in a three-act structure: suspense and wonder in the beginning; conflict and a little fun in the middle; and a final tragic end. It will be told with facts, not sentimentality. The centennial of the death of the last Passenger pigeon is September 1, 2014. The time to tell this story is now.